At today's event, Steve Jobs gave the audience a glimpse of the the space-age chambers that Apple uses to test its prototype iPhones. Apple published the pictures and, as MG Siegler said, it's basically Professor X's brain scan room. Updated. Jobs said that the test chamber is the "biggest room" on Apple's campus and explained that "you have to build these rooms or you don't get accurate results." The one shown above, according to the picture's file name, is actually called the "Stargate Chamber." 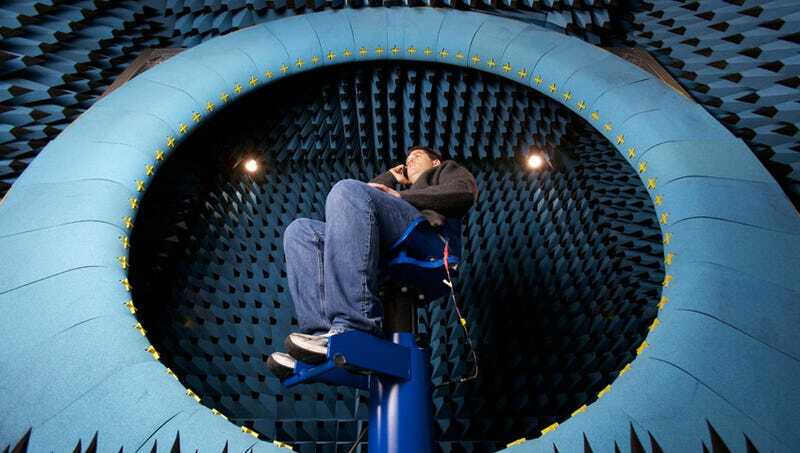 Apple invested over $100 million to construct 17 such anechoic chambers, facilities that are "connected to sophisticated equipment that simulates cellular base stations, Wi-Fi networks, Bluetooth devices - even GPS satellites." Apple has a pretty remarkable video tour of the facilities over at their new Testing Labs site.